The South Florida CMOR Card Covers from Jensen Beach to Key West on the Atlantic Coast. Deep Drop and Swordfish Grounds have been added from Stuart down through Miami. The Jensen Beach to North Mia coverage is over 500 square miles of Florida's most unique reef systems, artificial reefs and famous shipwrecks. The high-resolution coverage starts at Jensen Beach and continues all the way down to Golden Beach, located just north of Haulover Inlet. The depths covered on this card range from 1' at the shoreline to 120', which is past the third reef line for the majority of the area. The areas colored in dark blue and purple extend to over 400' deep. And most importantly, all the unnamed reefs between the well known areas! The Miami-Biscayne area covers 400 square miles of the most pristine diving and fishing areas in South Florida. The depths covered on nearshore section range from 1' in Biscayne Bay to 500' due east of Government Cut. Also included are 100 square miles of the premier deep-dropping and daytime swordfishing grounds in South Florida. The depths range from 900' to 2,900'. Some of the largest swordfish in South Florida have been caught in this area. This is also a great area to target rosy snapper, queen snapper, snowy grouper, and many other deep-water bottom fish. NOAA charts 11465, 11466, 11467, and 11468 are included in the background. All CMOR Cards come on Micro SD cards with a standard SD adapter included. And most importantly, all the unnamed reefs between the well-known areas! 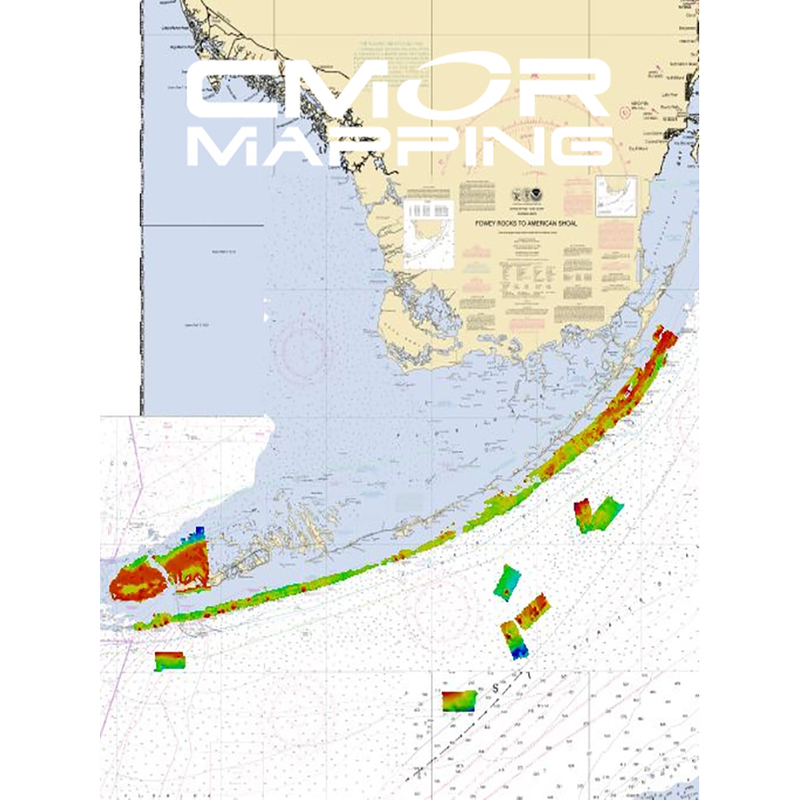 The Florida Keys section covers the outer reef from south of Carysfort Reef Light to Key West from 15' to 70' in most areas and out to 120ft in other parts. If you looking for some deep drop spots for tilefish, snowy grouper, rosy snapper, barrel Fish, or want to take a stab at daytime swordfishing, this is a must-have! If you're looking to dive or bottom fish for snapper/grouper and you're staying between Key Largo and Key West, this card will help you locate the structure that hold the fish! Lobsters will have no where to hide!